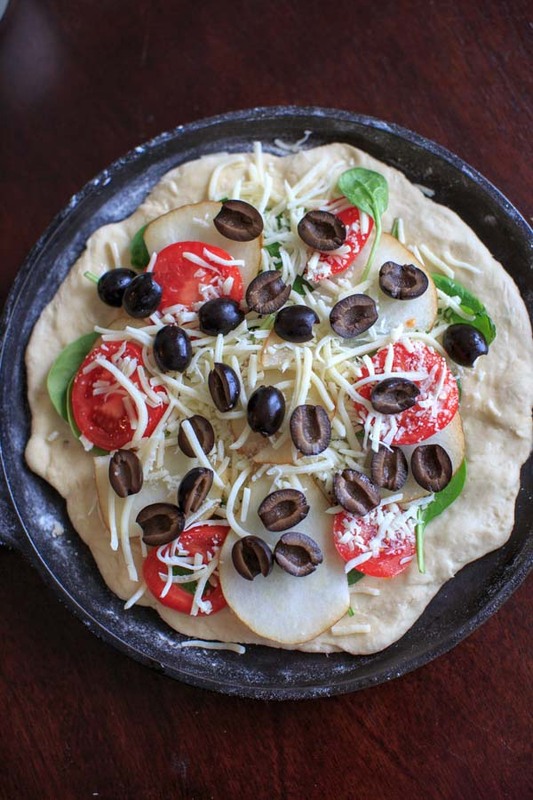 Homemade Pizza with Truffle Oil, Pear, Black Olives. 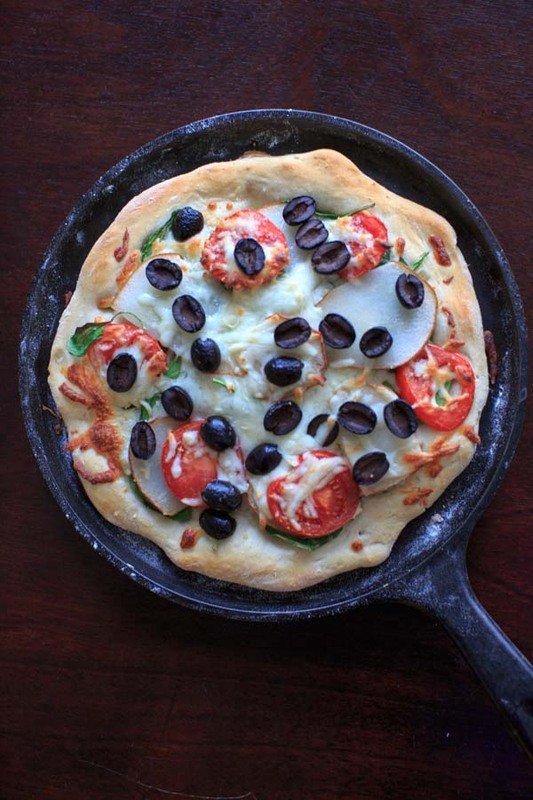 A sweet and salty combo to give pizza night a unique and delicious spin. Recently I was introduced to the wonders of truffle oil. It’s just flavored olive oil, but it tastes good. And is fun to say. Earlier this year my mom started putting truffle oil on homemade pizzas. There was one particular time that she got extra creative and made this pizza combination that was so good, I had to recreate it. Putting pear on pizza seemed weird to me at first, but then I remembered that pear & gorgonzola pizza is a thing, and quite a delicious thing at that. We didn’t have gorgonzola so we used regular mozzarella cheese, and she threw a few more ingredients on before I noticed what was happening. It turned out so good, guys! I love all these ingredients separately, but I never would have thought to put them together. 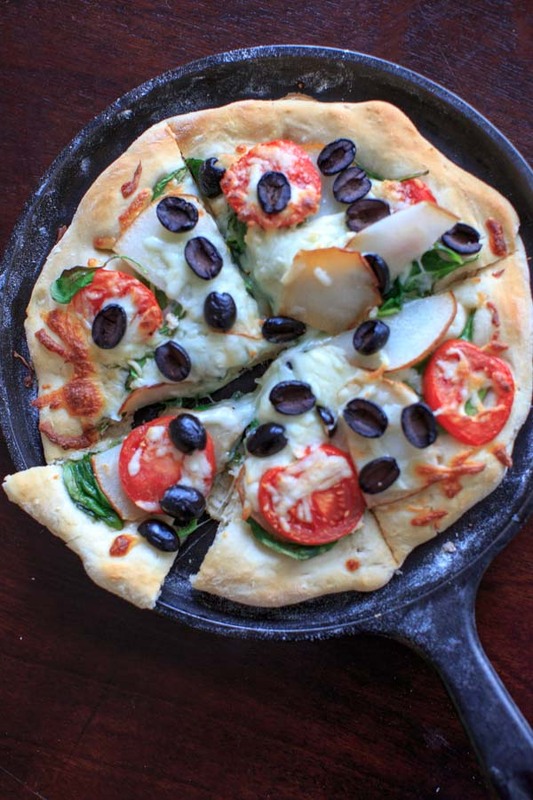 Pear and black olives may seem like a weird combination, but it’s something about the sweet and salty that made it work. We also added spinach and tomatoes, and a pinch of good sea salts. Don’t forget the truffle oil! 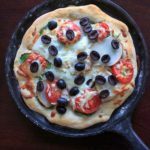 I used my handy homemade pizza dough recipe, which is why there seems to be flour everywhere in these pictures. I’m known to make pizza with weird toppings and even try some unique pizza crusts, but this is my favorite creation so far. You can never have too much pizza, right? Have you ever tried truffle oil on pizza? What are your favorite pizza toppings? 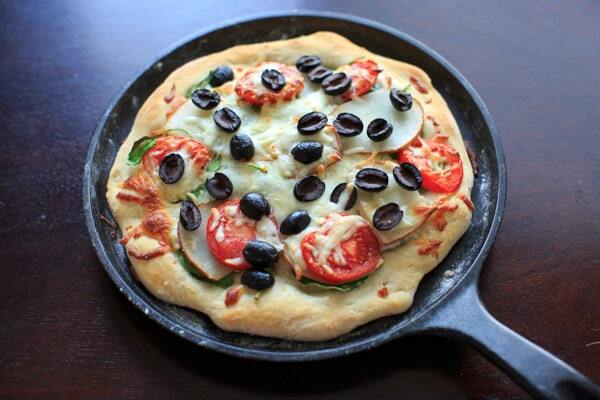 Place pizza dough on cast iron pan, drizzle the truffle oil over the dough and sprinkle the salt. Add all remaining toppings as desired. Bake for 12-15 minutes or until dough is lightly browned and cheese is melted.